Delta Outdoor Lighting specializes in the latest LED technologies. Coupled with professional design, low impact installations and an attention to detail, Delta's personal approach to each job sets us apart from the crowd. Whether it is low-voltage landscape and architectural lighting or line voltage commercial lighting projects we have you covered. We also have a great selection of Christmas Lighting options and full electrical services as well. Working closely with our clients, we incorporate their specific lighting goals and budgets into our lighting designs. As each property is unique, so are the lighting designs we create. Our experienced designers are specialists in creative lighting design. At apex audio video, our mission is to become your preferred partner for all of your home electronic needs. Our team is at the forefront of technology. Apex delivers the highest level of expertise in designing custom home theaters and home control systems that incorporate distributed audio & video, lighting, climate control, motorized window treatments, and so much more into one simple interface. Our philosophy is simple: We offer best-in-class products; coupled with best-in-class implementation; and our after sales service and support is parallel to none. Contact us today for a free in home consultation and let us enhance your home to Amenities and Beyond!!! Texas Outdoor Lighting is a locally owned business who uses American made products holding lifetime warranties. This veteran owned business has not only sustained but thrived for the past ten years. 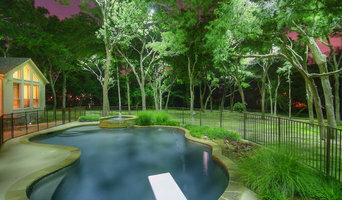 Texas Outdoor Lighting is known for it’s award winning design team. We hold high standards for each certified lighting installer on the team. In addition to installation, we have a full time maintenance crew. From your first phone call to your last installation, you will be treated like family. We can help with all of your residential outdoor lighting needs. We will work with you to add brightness to landscapes and outdoor living areas for comfort and safety. No matter the size of your home or vacation home, Texas Outdoor Lighting will provide superior time and dedication to your unique outdoor lighting design. We work with homes in many different stages of development such as established homes, new construction as well as those homes which are still in the drawing stages. 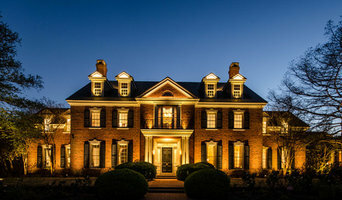 Use your southern hospitality to host gatherings and let us install the perfect lighting system to showcase your home. Best of Houzz 2019! ACA ELECTRONICS offers FREE estimates and White Glove Service on every single job! Free estimates because they believe their customers deserve the very best service that they have to offer! In order to offer the best service, they need to fully understand the customer's needs and sometimes they have to order product. White Glove Service on every job means that they will leave your space as clean or cleaner than they found it and take the utmost care of your home while they are working there. Both Chris and Dana are outgoing, extroverted and really enjoy people (and their animals)! They have a deep commitment to providing excellent customer service! They are both extremely creative professionals and truly enjoy the creative process. Chris has many years of experience as an AV professional and often comes up with creative solutions to customers' unique problems. Dana has a background in Interior Design so she tends to look at everything with an aesthetic eye. In 2015, Captive Audio created an extension of its already successful company to better meet the demand for outdoor lighting, appropriately called Captive Lighting. Captive Lighting aims to design the perfect outdoor experience and ambiance through the use of landscape lighting. We combine our expertise of architecturally beautiful homes with the client's vision to create a beautiful lighting system. Our knowledgeable team takes care of the whole process, from designing to installing to service, and can offer additional services like lighting control and automation through Captive Audio. Contact us today! We work with landscape architects to design and maintain your landscape masterpiece. Install, modify or upgrade your drip irrigation system and landscape lighting to integrate with your smart home. You deserve to pull up to a gorgeous yard! Let us help you figure out what is the right touch to transform your yard from nice or okay to amazing. Whether its a new deck, removal of an unsightly tree, light to bring out the architecture of your home, or a new sidewalk or sprinkler system, we have the expertise and track-record to deliver your dream. Take a look at some of our work! Lux Outdoor Lighting is a family owned Outdoor Lighting business. We have changed Austin Outdoor Living areas with illumination for 11 yrs and have built a long lasting relationships with all of our clients. We specialize in Landscape Lighting services. Lux Outdoor Lighting not only installs beautiful Lighting portraits but we also maintain ours and existing systems not installed by us as well. We are Austin's trusted home audiovisual installers. Our services include flat screen TV wall mount installations, internal cabling options, power relocation, and home theater installations. We carry all products you need with installation including TV wall mounts, HDMI cables, projectors, projection screens, receivers, in-wall, and in-ceiling speakers. Founded in 2007 Total Home Technologies concentrates on diluting the retail experience commonly referred to as the design process. Our process puts 100% of the power in our end users’ hands to make an informed, conscious decision with us by their side as a consultant more so than a salesman. At the end of the day once you’ve made a decision about your system you are not only investing in the product but the integrity of the firm which will be installing and servicing your system. At Total Home Technologies we understand that service after the initial system deployment is the key to keeping our clients happy and our referral-based business steady. Due to our “Service First” business model and our dedicated service team’s track record we have built a business that has taken us across the map – both nationally and internationally. Our two Texas-based design centers are open and waiting for the opportunity to guide you through the correct steps in making your electronic vision a reality. Our four-step process differs from the rest of the industry in a way that extends a lot of power to our clients. EDUCATE: We make sure to educate you on the industry, it’s capabilities, and how they can be tailored to your unique wants and goals. DESIGN: Once we have discussed ideas and established a baseline of understanding, we build your custom System Design based on your budget and needs. Our unique software allows you to add or delete features and see the results in real time, allowing you to build your own theater system with our professional guidance. BUILD: With your custom home theater design in place, we can have the whole system built in one day. We can even set up completely wireless so there is no sheet rock cutting or other alterations to your home. SERVE: We don’t wipe our hands of you once the job is done. We’ll follow up to ensure everything is working as you hoped and take care of any problems that may arise early on. We want to make sure our work. Whether we are starting from scratch or a full remodel we have the team to provide a turn key installation that is sure to impress you every time you hit play. We install systems that not only enhance our consumers living experience, but also simplify life. We provide the complete solution from design through implementation. Our systems include flat panel installation, whole-house audio/video, home automation, custom home theaters and outdoor systems. What services do Jonestown outdoor audio and visual system professionals provide? For the most part, people hire outdoor entertainment system providers for backyard installations. After all, pool parties and barbecues are much more fun when there is music to enjoy. How do they do it? Your Texas outdoor custom audio system technician can work with your landscape designer or architect to install weather-resistant outdoor speakers, discreetly buried into your landscaping with no loss of sound. Here are some related professionals and vendors to complement the work of outdoor lighting & audio/visual systems: Landscape Architects & Landscape Designers, Landscape Contractors, Decks, Patios & Outdoor Enclosures, Siding & Exteriors. Home theaters are moving outdoors, too. Sports fans can grill without missing the game, and families can invite neighborhood friends over for movie nights. Special weatherized flat-screen TVs are coated to minimize glare. 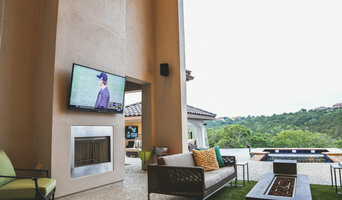 Imagine your Jonestown, TX backyard with a custom-designed outdoor theater system — complete with a large projection screen. It makes backyard entertaining easy. Find outdoor audio and visual system professionals on Houzz. Look in Houzz’s Professionals section to find Jonestown, TX outdoor audio and visual system experts. Narrow your search to the nearest city or metro area for a list of nearby businesses. Get contact information, read reviews and look at completed Texas custom outdoor sound system projects.